Actually, Aristotle probably got it the closest, as we'll see. 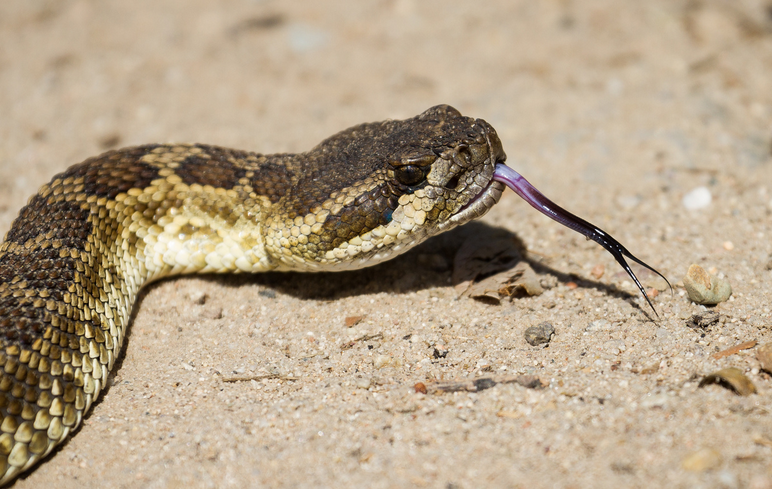 Over the last 20 years, members of the laboratory of Kurt Schwenk, a University of Connecticut ecologist and evolutionary biologist, have published a great deal of interesting research on the function of snake tongues. Most animals with tongues use them for tasting, to clean themselves or others, or to capture or manipulate their prey. A few, including humans, also use them to make sounds. Snakes do not use their tongues for any of these things, although they come closest to tasting. A more accurate description of what a snake uses its tongue for is collecting chemicals from the air or ground so that the snake can smell them. By itself, a snake's tongue can neither smell nor taste. Snake tongues have no taste buds1. Instead, the tongue is best thought of as a specially-shaped chemical collector. This is because the actual smelling - the conversion of the chemicals into electrical signals sent to the brain by way of receptors - takes place not on the tongue but in the vomeronasal or Jacobson's Organ, which is in the roof of the mouth (and, incidentally, also the name of a pretty sweet band). For a long time everyone thought that the tongue delivered chemicals directly to the Jacobson's Organ, because both the Jacobson's Organ and the pathways that lead to it are paired just like the tips of the tongue. Even this recent Encyclopedia Britannica figure falls victim to this assumption (edit: a few days after this article posted, Britannica Earth & Life Science editor John P. Rafferty tweeted me to let me know that they had updated the article, including a new diagram). In fact this is, as Schwenk put it, a red herring. Instead, x-ray movies have revealed that the tongue does not move inside the closed mouth, but that each side of the tongue deposits the chemicals it has collected onto pads on the floor of the mouth (called the anterior processes of the sublingual plicae, in anatomical jargon) as the mouth is closing. 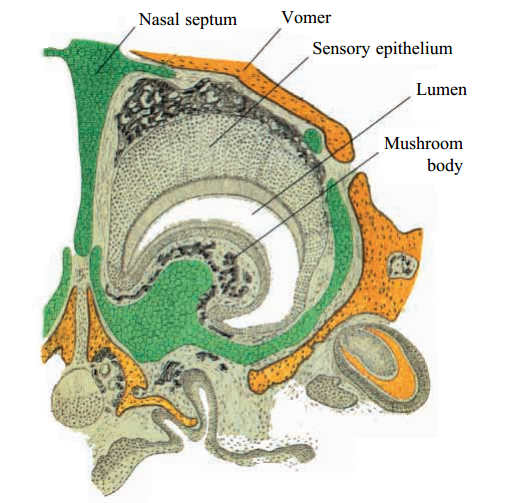 It is most likely these plicae that deliver the sampled molecules to the entrance of the Jacobson's Organ (the vomeronasal fenestrae) when the floor of the mouth is elevated to come into contact with the roof following a tongue flick. Further evidence for this heretical notion is that geckos, skinks, and other lizards lack deeply-forked tongues but deliver chemicals to their vomeronasal organs just fine, and in fact so do turtles and many mammals and amphibians (although in none of these groups is the Jacobson's Organ as well-developed as in squamates). Because it is forked, the tongue of a snake can collect chemical information from two different places at once, albeit places that are fairly close together by human standards. Snakes often spread the tips of their tongues apart when they are extended, sometimes to a distance twice as wide as their head. This is significant because it allows them to detect chemical gradients in the environment, which gives them a sense of direction - in other words, snakes use their forked tongues to help them smell in 3-D. Owls use their asymmetrical ears in this way. Snakes and owls use similar neural circuitry to compare the signal strength delivered from each side of the body and determine the direction that a smell or a sound is coming from. (Humans do this with our hearing too, but we're not as good at it). This ability makes it possible for snakes to follow trails left by their prey or by potential mates. 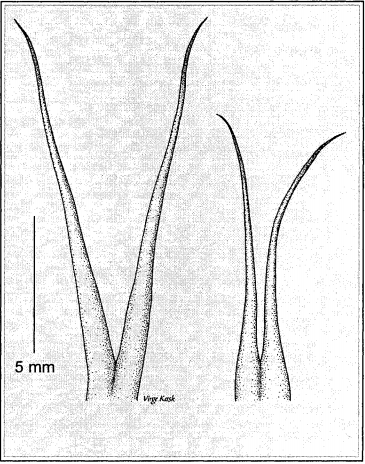 In the 1930s, before guidelines on the ethical use of animals in research were as strict, German biologist Herman Kahmann experimentally removed the forked part of snakes' tongues and found that they could still respond to smells, but that they had lost their ability to follow scent trails.2 Later experiments by John Kubie and Mimi Halpern refined and confirmed this result using the more humane method of blocking the entrance to the Jacobson's Organ on one side and found that these snakes turned in a circle toward the unblocked side when they tried to follow a trail (although one recent experiment that severed the vomeronasal nerve on one side did not support this hypothesis). In the 1980s, snake biologist Neil Ford watched how male garter snakes used their tongues when they were following pheromone trails left behind by females. He found that if both tips of the male snake's tongue fell within the width of the trail, the snake continued slithering straight ahead. However, when one tip or the other fell outside the edge of the trail, the snake turned his head away from that tip and back towards the pheromone trail, and his body followed. Following this simple rule allowed the snakes to perform trail-following behavior that was both accurate and directed. If both tongue tips ever touched the ground outside of the trail, the male would stop and swing his head back and forth, tongue-flicking, until he relocated the trail. Snake ecologist Chuck Smith found evidence that male Copperheads have longer, more deeply-forked tongues than females, which presumably enhances their ability to find mates. Although sexual dimorphism is rare in snakes, differences in tongue size are likely to be present other species as well. Scent-trailing is probably also quite helpful to snakes tracking down prey, including for sit-and-wait predators like vipers, which have evolved smelly but non-toxic venom components, about which I've written before, to help them relocate bitten and envenomated prey items. Many lizards that are active hunters also have deeply forked tongues which they spread apart when tongue-flicking, whereas lizards such as geckos and iguanids are mostly either ambush predators or herbivores and have blob-like tongues. Whether following mate or prey, how snakes and lizards determine that they are following the scent trail in the right direction is unknown. When following a scent-trail, snakes simply touch their tongue tips down to the ground to pick up the chemical information lying there (top panel, left). But snakes can also use a different type of tongue-flick (bottom two panels) to sample airborne chemicals. Snakes often wave their tongues in the air without putting them in contact with anything. The tongue creates self-reinforcing air vortices. Vortices formed in the water by boats drift away from the boat as they form. 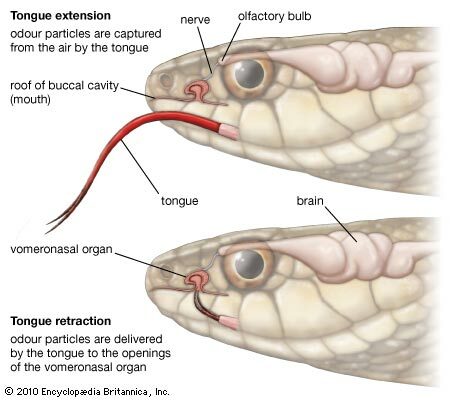 Bill Ryerson, another student in the Schwenk lab, found that the vortices created in the air by snake tongues have a special property - they do not drift away but rather stay in the vicinity of the tongue, where they can be sampled repeatedly as the tongue skirts the part of each vortex where the air velocity is the highest. Oscillating tongue-flicks are unique to snakes. They usually last 2-3 times longer and can sample 100 times as much air as the simple downward extension of the tongue. The tongue then transfers these molecules to the Jacobson's Organ via the same route described above. 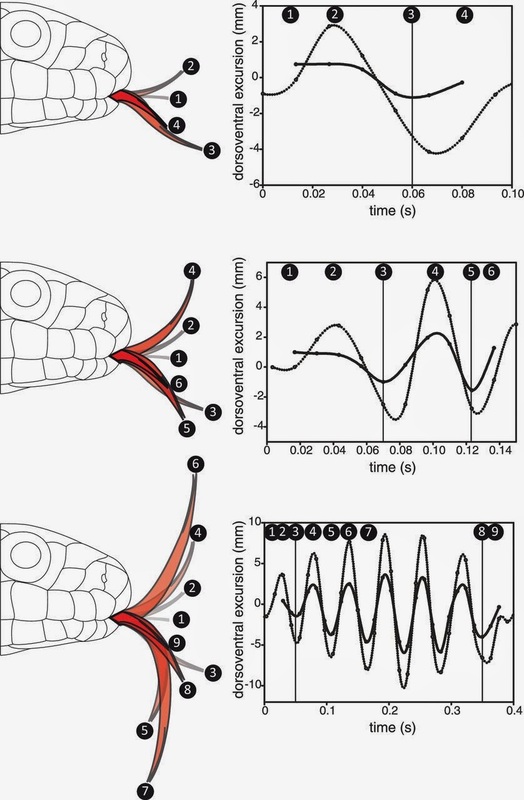 Evidence suggests that male Copperheads can also find females using oscillating tongue-flicks to detect airborne pheromones, although the details of how they determine direction using such dispersed and transient odors are poorly understood. 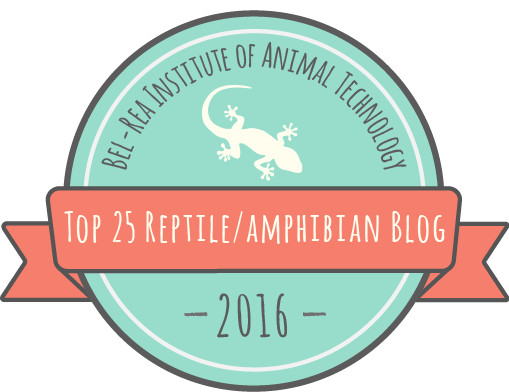 We have much to learn about this incredibly advanced sensory system and the role it has played in the evolutionary success of snakes. Thanks to Bill Ryerson for giving such an engaging talk at SICB 2014 and for talking with me after, so that I was inspired to research and write this piece, and to JustNature and Zack Podratz for allowing me to use their photographs and videos.